SAN DIEGO (KGTV) - Hours spent in after-school programs can play an important role in a child's development. Advocates say they're essential to closing the achievement and opportunity gap, providing underserved students with additional academic hours, enrichment activities, and a safe environment. While California fares better than many states when it comes to availability and affordability, some programs still end up filling to capacity. For K-8 programming, before and after school programs are funded through the state of California's After School Education and Safety Program (ASES) or the federally-funded 21st Century Community Learning Centers (21st CCLC) . California's ASES program is funded through a 2002 voter-approved initiative and current funding is $550 million for programming throughout the state. School sites receive funding based on their Free and Reduced Priced Meals (FRPM) rate through a competitive grant process. While the costs, demands, and expectations of ASES programs have consistently increased, advocates say the funding has not kept pace for over a decade. The 2017-18 budget raised the daily funding formula from $7.50 to $8.19 per student, only about half the funding needed to keep pace with the $11 minimum wage. Some schools offer fee-based options in addition to their free programming. Schools serving 9-12 students are able to through 21st CCLC (ASSETs) funding. All students have access to programs being offered at their school sites and there are no wait lists. Since funding is tied to free or reduced-priced meals rates (FRPM), it is important that parents submit this documentation as requested by school sites each fall. For K-8 programs, priority for enrollment is given to students who can attend the full range of hours every day. Make sure that your school site coordinator knows that you are committed to having your student stay in the program during the entire hours of operation. Check in with the school site coordinator periodically regarding your application if you are on the waitlist. It is important for parents to learn more about the expanded learning offerings in their community and to become active in speaking to their school, local, and state representatives about the need to increase funding for expanded learning. 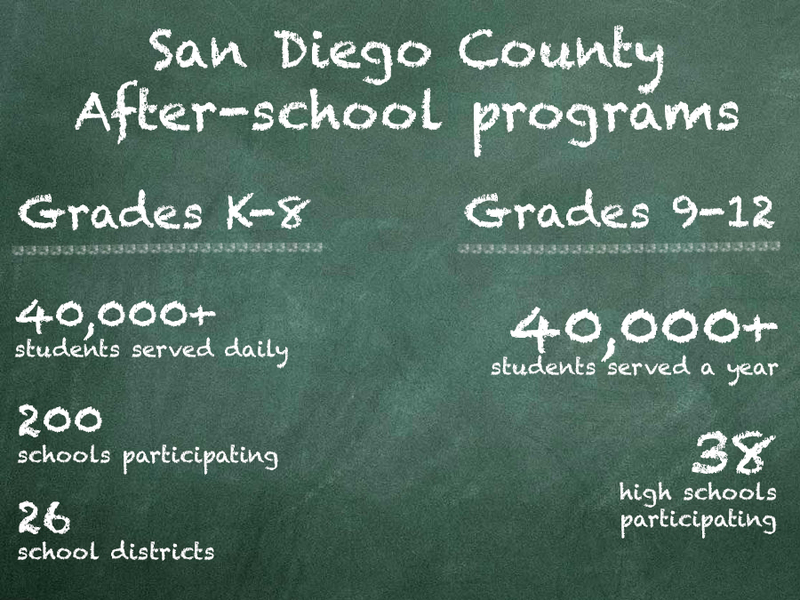 In San Diego County, after-school programs are often run by community providers such as the Boys and Girls Club or YMCA. School sites contract with these providers to offer before and after-school services. The Y says their approach is more than just supervising children. The organization focuses on youth development, healthy living, and social responsibility. “We want to keep being creative and innovative because demand is only going to get higher and we want to be there for families," said Leane Marchese, Associate Executive Director of Youth Development at the YMCA. “We don’t want anybody to be turned away." They offer a variety of before and after school programs, including programs on elementary school campuses, on-site licensed childcare, and licensed preschool. The YMCA is currently hiring for before and after-school programs.